Part 1 – Why Invest in Property? It’s worth taking a closer look at each of these. Here’s a fact. Australia’s population is growing every year. In 2007/08, around 171,400 new migrants settled in Australia – the biggest migration program since the 1960s. In 2008/09, a further 203,000 new arrivals are expected to settle in this country2. All these people need somewhere to live, and historically around one in three Australian households rent their home3, providing strong demand for rental properties. Generally most investment properties can expect to earn ongoing rental income. One of the pluses of rent is that it is usually a very stable source of income. Residential tenants typically sign up for leases lasting 6 or 12 months though many tenants remain on a periodic (week to week) lease once the formal lease expires. 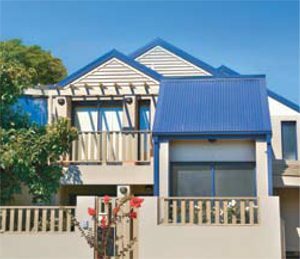 In addition to regular rental income, property investors can expect to earn long-term capital growth on their investment. As with rents, price appreciation will depend on a range of issues – with location and scarcity being key factors. Industry bodies produce regular updates of movements in property values however it’s worth remembering that property should always be regarded as a long-term investment – something you should be prepared to hold for at least five to seven years. This way your returns will be evened out across periods of market highs and lows. If you have held onto a property for greater than 12 months, only 50% of any profit on the sale of the property is taxed. One of the golden rules of investing is not to put all your eggs in one basket. Property returns tend to be generally far less volatile than those of, say, the sharemarket and an investment in property can add valuable versification to your portfolio. 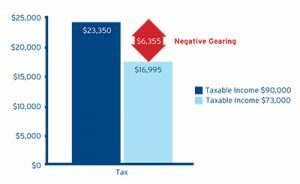 Negative gearing describes the situation where the costs of owning an investment exceed the returns it generates. The shortfall can be claimed as a tax deduction, which reduces the amount of tax you can expect to pay on other sources of income. Let’s take a look at a simple example to see how this works. We’ll say Victoria earns a salary of $90,000. On this amount she can expect to pay tax of $23,350 (includes 1.5% Medicare Levy). Now let’s say Victoria invests in a rental property. After taking into account mortgage interest, repairs, rates and other costs, the property generates a loss for the year of $17,000. This will reduce Victoria’s taxable income to $73,000. On this amount she can expect to pay total tax plus Medicare of $16,995 – a saving of $6,355 generated by negative gearing5. Please note – an investment should always stand on its own merits, any tax benefits should be seen as a side benefit rather than the key motivator for investing. An investment is said to be positively geared if the rental income it earns exceeds the expenses associated with owning and managing the investment. One of the benefits of owning a positively geared property is that it provides an extra source of income – money that can be used to invest in additional assets! Part 1 - Why Invest in Property?